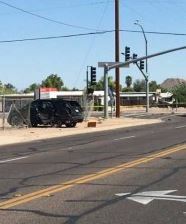 Baseline and 7th Street, Phoenix. 6/24/2018 around 4pm Baseline near 7th st, Phoenix. 5/20/2018, 743am. Ellsworth and Broadway. 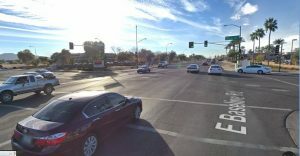 A little girl and her mother became collateral damage after two drivers collided, one vehicle began spinning and “jumped the curb of the southwest corner of the intersection (two pedestrians), who were standing on the sidewalk”. One driver was attempting to turn left, the other going straight (a “left cross”); who caused the wreck? Police are still investigating, it’s not clear which of the two drivers caused it; what is clear is that one or the other or both drivers caused a crash that seriously injured the little girl, and caused minor injuries to her mother who were on the sidewalk at the time.